10-Time World Champion, Superior Cow Award and ITLA Championship Futurity Winner. 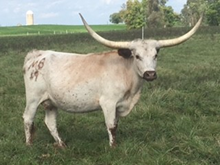 A Top Caliber granddaughter who has combined very good with Peacemaker 44 over Wyoming Warpaint. Tip to Tip 60.0000 05/20/2014 2 Year and 1 week old.